GAINESVILLE, Florida, September 30, 2011 (ENS) – Florida has the world’s worst invasive amphibian and reptile problem, and a new 20-year study led by a University of Florida researcher verifies the pet trade as the top cause of the non-native species introduction into the state’s environment. The study uses fieldwork data from 12 co-authors throughout the state and research using specimens in the Florida Museum of Natural History collections on the University of Florida campus. The research covers a period of 147 years. It shows that from 1863 through 2010, there have been 137 non-native amphibian and reptile species introduced to Florida. About 25 percent of those have been traced to one animal importer. The first introduction in 1863 was of the greenhouse frog, native to the West Indies. “Most people in Florida don’t realize when they see an animal if it’s native or non-native and unfortunately, quite a few of them don’t belong here and can cause harm,” said lead author Kenneth Krysko, herpetology collection manager at the Florida Museum of Natural History. “No other area in the world has a problem like we do, and today’s laws simply cannot be enforced to stop current trends,” said Krysko. Florida law prohibits the release of non-native species without a state permit, but offenders cannot be prosecuted unless they are caught in the act. To date, no one in Florida ever has been prosecuted for the establishment of a non-indigenous animal. The study also shows that no established, non-native amphibian or reptile species ever has been eradicated. Researchers are urging lawmakers to create enforceable policies before more species reproduce and become established. The study names 56 non-native species that have become established in Florida: 43 lizards, five snakes, four turtles, three frogs and a caiman, a close relative of the American alligator. Defined by the U.S. Department of Agriculture as organisms “whose introduction causes or is likely to cause economic or environmental harm or harm to human health,” invasive species are a growing concern for residents and policymakers. 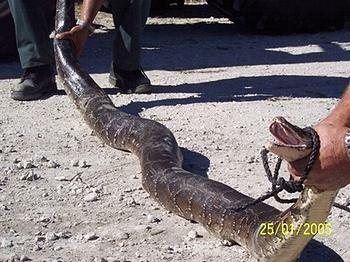 Floridians have experienced some of the damage these animals can cause, from iguanas that destroy cement walls to Burmese pythons released in the Everglades that eat protected species. While the impact of many of the introduced species has not been determined, the study provides new information about how, why and when they entered the state. One of the most easily recognized species is the brown anole, the first introduced lizard, which reached Florida from Cuba via cargo ships in 1887. Until about 1940, nearly all non-native species arrived through this accidental cargo pathway, but the boom in popularity of exotic terrarium animals in the 1970s and 1980s led to the pet trade being accountable for 84 percent of the introductions, Krysko said. One of the greatest obstacles pet owners face is how to feed and house an exotic animal that has become too large or difficult to handle, Krysko said. Some owners just release problem animals into the wild. Other pathways include biological control, in which an animal is intentionally released to control a pest species, and accidental introduction through the zoo or plant trade. The study will serve as a baseline for establishing effective policies for control or eradication, said Fred Kraus, a vertebrate biologist at the Bishop Museum in Honolulu who helped establish policies for invasive amphibians and reptiles in Hawaii.